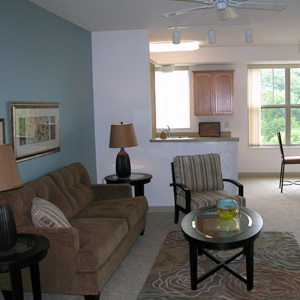 The Lodge features five unique and spacious one-bedroom floor plans ranging from 806 sq. ft to 1,165 sq. ft. The 9-foot ceilings will amaze you with the grand feeling of openness. The bedroom is roomy enough for a king-size bed. Ample closets have custom shelving and shoe racks. The kitchen is amazing with an open-concept, snack bar, dishwasher, microwave, refrigerator with ice maker, glass-top stove, Lazy-Susan shelving and beautiful custom cabinets with crown moldings. All the apartments have a washer and dryer for your convenience. Some selected floor plans include: Task Center for your computer or other electronics, dens and balconies. Please click here to see floor plans and approximate room measurements. The Lodge features four exceptional and distinctive two-bedroom floor plans ranging from 1,159 sq. ft. to 1,362 sq. ft. The 9-foot ceilings make for a grand impression of openness and spaciousness. All the two bedrooms have an exclusive Task Center for computers or other electronics. The angled walls in some of the floor plans make for a very modern and rare custom look in an apartment. All two bedroom apartments feature two full baths, abundant closets with custom shelving and shoe racks. The private and impressive bedrooms will give roommates solitude and a hideaway for their “own space”. The kitchen is amazing with an open-concept, snack bar, dishwasher, microwave, refrigerator with ice maker, glass-top stove, Lazy-Susan shelving and beautiful custom cabinets with crown moldings. 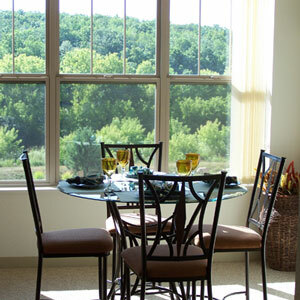 Some selected floor plans include: balconies, pantries, walk-in closets and a window above the kitchen sink for a beautiful nature view.